But what do you know of EXERCISE TIGER? Off Slapton Sands on the coast of Devon, 946 American servicemen perished during what was known a Exercise Tiger, a rehearsal for what would be the D-Day landing on Utah Beach in Normandy, France. This occurred but nine days before the event mentioned above – on April 27, 1944. Some 3000 residents from Slapton, Strete, Torcross, Blackawton and East Allington in South Devon departed their homes as part of the exercised designed by the American military. 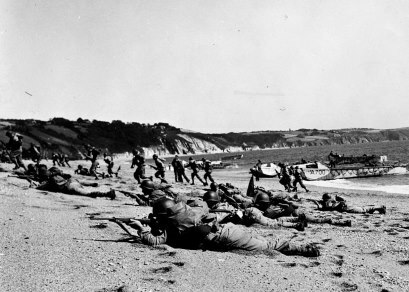 Slapton Sands reportedly resembled the Normandy coast line, and, therefore, it was chosen for the military simulation. The exercise conducted upon Slapton beach also proved disastrous. It included a live-firing exercise creating what we now call “friendly fire” deaths from the naval bombardment. The losses occurring during this event were kept secret until long after the war had ended. Slapton was not the only site in Devon to be used by the American military during World War Two. The north coast around Woolacombe Bay was also used for practising amphibious landing assaults in preparation for the D-Day landings. This entry was posted in American History, British history, Great Britain, history, Living in the UK, military, war and tagged American history, British history, D-Day invasion, Exercise Tiger, Lyme Bay, military, Slapton Sands, South Devon, World War II. Bookmark the permalink. It’s my second book on Tiger in thirty years. My first, called Channel Firing in the UK, Exercise Tiger in the US, was published in the late 1980’s. Hey, Nigel, would you like to do a guest post on my blog to promote your book? How many words, and when would you want it by? I’d never heard about this, Regina. Neither had I, Gerri, until I was constructing a D-day post for today. I had no idea about this, even though my father’s side of the family comes from Devon. Thank you for a fascinating, albeit tragic, read.